Detla 9 improves the enzyme and protein activities that are determinant for the biosynthesis of cannabinoids, mainly THC. Guaranteed. The dicovery of the biosynthetic pathways of CBD and THC has led to a new window for the study of endogenous cannabinoids production in Marijuana plants. THCA synthase is a heavy protein which its enzimatic activity is directly involved in the biosynthesis of tetrahydrocannabinolic acid (THCA) and consequently THC. When the activity os such enzyme is inhibited, the THC levels consequently decreases and to respond to such reduction, other secondary cannabinoids elements are produced. CannaBioGen R & D has developed DELTA 9. It has made a great revolution in the market by having three natural substances that are produced in living forms. These substances were retrived from the pharmaceutical industry without any phytotoxicity. Delta 9 act as a synergestic situmlant of the natural processes of Cannabis metabolism WITHOUT CHANGING IT, improving a specific enzymatic activity and biosynthesis of cannabinoids, mainly THC. For the plants to a have an easy and suited development as well as to induce other bioprocesses directly related (storage, cofactors of organic and inorganic substrate, enzymes, essential amino acids, etc. ), we have inserted a pure extract coming from seaweed species like Ascophyllum nodosum. CannaBioGen R & D has tested several commercial compounds of algae species, choosing the greater ones according with the quality and amount of bioactive elements and nutrients coming from crops in the enriched waters of the Atlantic North. Its application and correct treatment provide in a natural form, over 60 micro and macronutrients, carbohydrates, amino acids and growth enhancers to raise the production, flowering, quality and vigor in Marijuana plants without incompatibility or excess issues. The amounts of cytokinins, auxins and natural giberilins induce mytosis and biosynthesis of proteins and enzymes. Cytokinins are present in every phase of the plant growth, from root formation to the development of stems, leaves and buds. Their influence on Marijuana plants are remarkable, especially for their influence in the resistance of stress, thus resulting in an increased production of enriched cannabinoids resins without affecting the performance upon the development of each individual allowing a greater tolerance. Its influence in the synthesis of enzymatic antioxidants (Dismutase, Peroxidase and Reductase, mainly) and non-enzymatic (alpha-tocopherol/Vitamin E, beta-carotene/Vitamin A and ascorbate/vitamin C), protect the cellular membrane agaisnt oxidation and deterioration thus creating the endogenous concentration of resins. The perfect uptake of macro- and microelements in the necessary moment, naturally influenced by amino acids, makes the plant to have a remarkable development and vigor. Besides that, amino acids also function as powerful biostimulators of Marijuana, so it is crucial to provide additional nutrients in our formulation for a fully development potential from the plants. Betaines, polyamines and oligosaccharides, also play an important role in cell metabolism. They specially favor the cell osmotic balance besides protecting them and also improve their functionality without significant cell damage. On the other hand, polyamines and oligosaccharides are naturally produced by plants they appear to stimulate the production of ethylene that consequently influences the quality, floral maturation, aroma and taste, while reducing the extra energy waste directly involved in the production of these substances by the plant and when supplied in the outside. Finally, it raises the systemic acquired resistance (SAR) due to the biosynthesis of proteins so the plants can be "vaccinated" against diseases, insects and stress, thus improving the development of buds and cannabinoids without deteriorating other biological substances. In this way, the genesis of each individual seems to have no end and beesides that, it gives a higher flower yield. Main biostimulation of all metabolic processes in Marijuana plant, through a selective incorporation of accurate substances for this plant. Stimulates and facilitates the development of terpenes, cannabinoids (geranyl pyrophosphate and Cannabinogerol) and biosynthesis of THCA (tetrahydrocannabinolic acid). Two specific elements act as cofactors of the ferment substrate in the enzymatic catalysis of THCA thus raising the production of this enzyme. Activation and selective stimulation of "THCA synthase" enzyme, essential for the production of THC. A minimum of THREE applications are required, preferably FOUR, TWO by foliar and stem spray and TWO on the soil or in any medium substrate (including hydroponic systems) for a root absorption through a sprinkler or drip. It is an ideal substitute of fertilizers. However, its exclusive application increases greatly the crop yield and harvest, so it should be used complementarily with other fertilizers. Two applications, for the first add 4-6 milliliters per liter of non-calcareous water in the pre-flowering stage (one week before the flowering to begin) spraying the entire plant. For the second, apply the same dose (10-15 days between each application) 10 days after the flowering process. 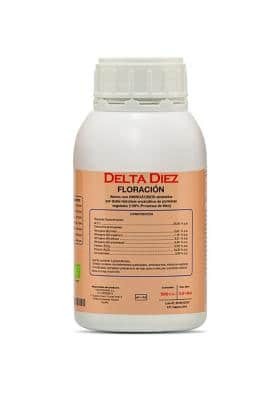 Apply it at the start of the flowering period and in the peak of the floral period (thirty days after the start of the flowering period, approximately), add 4-6 milliliters per liter of non-calcareous water in both cases, and a third of 6-8 milliliters/liter 15 days prior the last one (45 days after the start of the flowering period). CE at 25 degrees of 1240 mcS/cm with a dose of 5 ml/l. All kinds of products that have a pH between 5 and 8. 1240 CE at 25 degrees of 1240 mcS/cm for a dose of 5 ml/l. Compatible with all types of products tthat have a pH between 5 and 8.